Add a single extension or a range of extension numbers associated with the organization. Note: Before you assign an extension number to a user, you must first add the number to an extension pool. Extension Start The single extension number, or the first sequential number in a range of extension numbers. Extension End The last sequential number in a range of extension numbers. This field is blank if only one extension number was entered in the Extension Start box. Click the Extension Pools tab. In the Extension Start field, type the extension number that you want to add to the organization. Leave the Extension End field unchanged. The extension number is now available for assignment to a user. In the Extension Start field, type the first sequential extension number for the range that you want to assign to the organization. In the Extension End field, type the last sequential extension number for the range that you want to assign to the organization. The extension numbers are now available for assignment to users. Under People and Permissions, click People. The Manage People page displays. In the Search field, begin typing the user's first or last name and click Edit Person next to the appropriate match. The user's profile displays. In the Person Details tab, click View Edit Mode. In Contact Information, click Edit. Under Phone, find the phone number that you want to add the extension number to and type it in the ext. field. Note: Do not add an extension number in a Work Phone entry that contains a previously entered phone number. This action prevents PureCloud from generating a dial plan for the user, and the extension does not appear in the list of extensions on the Assignments page. 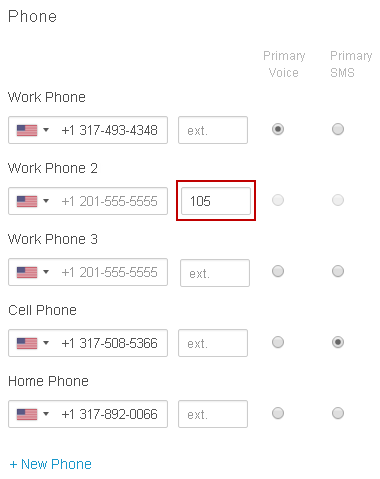 Add the extension number in an empty Work Phone entry. If the extension number you want to remove exists within a range, you must delete the entire range of extensions. You cannot delete a single extension from a range unless it was originally entered as a single extension number. Also, you cannot delete an extension pool when an extension within the pool's range is assigned to a user. Find the extension number or range of numbers that you want to remove and at the end of the entry, click X.